Beginning in 1954, the now decades old, ever-expanding building located at 635 West 12th Street in Baxter Springs Kansas, has seen it’s share of manufacturing highs and lows. Built on the hard work, ingenuity and sweat of its employees, then McCartney Manufacturing Co. was the very fabric of American manufacturing in post WWII era. Joe McCartney’s dream began in 1947, 2 blocks east, in an abandoned gas station where he built equipment for the manufacturing of wooden toys. The company moved to a larger facility in 1954, and evolved into making parts for the booming polyethylene business, primarily supplying parts for poly-gas oil compressors to the Ingersoll Rand Company. Due to poor health, Joe sold his company in 1963 to Ingersoll Rand (now KMT) where they began experimenting with high pressure intensifiers, and discovered that “water under pressure” could cut most anything! In 1971, history was made when the very first commercial use waterjet cutting system was installed for the Alton Box Board Company*, a cardboard box manufacturing facility. Known as the "Fluid Jet Cutting System", it eliminated the use of commercial saws, and was designed for the contour cutting of furniture packing forms for the Papertube Division in Jackson, TN. Since 1971, the proud employees of McCartney LDPE Manufacturing, Ingersoll-Rand and today, KMT Waterjet, have served a pivotal role as true pioneers in the manufacturing industry by developing leading designs of waterjet intensifier pumps and precision cutting heads. Since then, thousands of companies around the world have harnessed waterjet cutting to manufacture products for use in a variety of industries. Since it's origin, McCartney LDPE Manufacturing has been on the cutting edge in the high pressure cutting industry. In 2003, Sweden based Karolin Machine Tool (KMT) Co. expanded their tooling business by purchasing the poly and waterjet division from Ingersoll Rand. The Baxter Springs location currently employs approximately 180 people, is the corporate office of KMT Waterjet Systems, and is globally recognized as a leading manufacturer of waterjet systems. KMT waterjets are sold worldwide with offices in Brazil, Canada, China, France,Germany, India, Italy, Korea, Mexico, Poland, Spain, United Arab Emirates and the UK. Additionally, the polyethylene division continues to thrive and grow, and carries on the legacy of the McCartney name, where it is known worldwide as KMT McCartney LDPE Products. 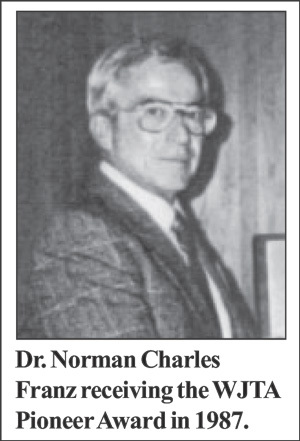 Dr. Norman Charles Franz, a WJTA Pioneer Award winner, invented industrial waterjet cutting in the 1960s. 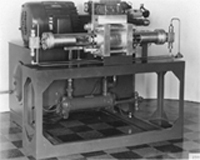 This invention was a spin-off of a research program that Dr. Franz was conducting on the machining of wood. The use of waterjets to cut wood was inspired by the observation that broom handles used for testing for leaks from very high pressure boiler systems were cut off by the escaping steam. Later investigation showed that industrial cutting with steam jets was impractical because of the high gas pressures involved. However, this suggested the use of waterjets. Dr. Franz experimented with a single action intensifier, which developed over 50,000 psi waterjets, but the waterjets were discontinuous. He was thereby able to cut wood and other materials with ordinary water. Dr. Franz then searched for a high pressure pump that would pump water continuously so as to produce a steady waterjet. He arranged a loan from McCartney Manufacturing, a subsidiary of Ingersoll Rand (now KMT Waterjet Systems), of a high pressure intensifier pump used for catalyst injection in the manufacture of polyethylene. This proved to be a reliable system for the continuous pumping of high pressure water. This pump and nozzle was duplicated and integrated with a system for obtaining relative motion between the jet and the work piece. Such a system was installed at Alton Boxboard Company to cut large, complex parts used in the furniture industry. He thus solved the problem that could not be handled by conventional cutting tools. He had a unique solution to a unique production problem. This jet cutting system was the first in industrial use and it operated successfully for many years. It was the precursor to the multi-billion dollar, worldwide waterjet cutting industry we see today. Dr. Franz was also a leader in the improvement of waterjet cutting at long stand-off distance by the addition of long chain polymers to the water. He included an automated polymer mixing system in the Alton Boxboard installation, and therefore he was the first to apply long chain polymer additives in commercial waterjet cutting.